TGIF! A Visit To Nino Salvaggio’s International Marketplace & How I Spent My Friday – Thank Goodness It’s FOOD! This post may contain affiliate links. I receive a commission from items purchased through these links with no additional cost to you. My husband has Fridays and Saturdays off work for the time being. We spent the early part of the day cleaning and tidying up our house, it was long overdue. I love spending quality time with my family. Joe leaves for work early in the morning and works long hours so we do not get to see him much during the week. We had an awesome day full of good eats and a little trip to Nino Salvaggio’s International Marketplace. My daughter and I were also spending more time working on a product review for a popsicle maker. We have been having a blast experimenting with the pop maker. She was so happy yesterday when I gave her a vanilla protein popsicle that I had made with Svelte’s vanilla shake and a few candy sprinkles. You can see her joy for this pop in the image below. Chloe was happy to also have a kiwano horned melon to nosh on yesterday. We mistakingly got 3 of them in an Instacart order and they let us keep them. They were supposed to be cactus pears. When I called up to inform them that I received the wrong item they sent the wrong item to me AGAIN. They ended up giving me golden dragon fruits. I am going to assume that the Instacart shoppers are a little baffled on an order that involves exotic fruits because they never got that order right. We were all craving something spicy last night so we decided we would go to one of our favorite Thai restaurants~ Sy Thai in St Clair Shores, MI. We have been visiting this spot for several years now and we can always rely on the food being fresh and delicious! We decided we would order a lychee bubble drink and all share. Sy Thai is known for making gigantic bubble drinks. The one we received yesterday may have been the largest one we received to date. It was huge. Another thing that I love about Sy Thai is their soups that come with the dinner. Many Thai restaurants do not include soups with the dinners. We had hot and sour soup yesterday and me and Joe loved it. My daughter, on the other hand, did not care for it. Hot and sour soup is really not a kid-friendly soup. It has a taste that is hard to describe. I wanted to try something new yesterday. I also knew that I needed to have some kind of noodle dish. I am a huge fan of Thai basil and I usually enjoy ordering the drunken noodle but I ended up trying out the Karee Basil Noodle. Joe ordered his usual Pad Thai. That is the dish he often goes with. I really enjoyed the flavor of my dish but the rice noodles in there were so thick they were almost like dumplings. I have never in my life had noodles that were that thick! After our dinner, we wanted to do a bit of shopping at Nino Salvaggio’s. We visited the smaller location in St Clair Shores since that one is the closest to our home. I did not really have any idea what I wanted to come home with. I was pretty much just on a mission to challenge myself to find something new and unusual to take home. The first thing that really caught my eye when I walked in to Nino Salvaggio’s was the fresh green figs. Oh man… I sure do love my figs. I love the red and green. Nino’s had the green ones in stock so I grabbed a few. I would have loved a whole case but my wallet said no. I was hoping to find some purple carrots while I was at Nino Salvaggio’s. I have a newfound love for them. I did locate a bag of mini rainbow organic carrots and I could not pass that up. They will make a great side dish for one of my dinners this week. I love roasted carrots with some raw honey drizzled on top. So damn good! Me and Chloe have been eating a ton of fruit lately, and I mean a lot! We ended up taking home a few interesting fruits that were brand spankin new to us: baby bananas, Forelle pears, guava, midnight rose apriums, and yellow plums. You can see my haul from Nino Salvaggio’s International Marketplace in the images that follow. Some people get excited about buying new clothes, buying new makeup, or buying a new video game. I get most excited about buying new food! And wowza!~ Nino Salvaggio’s sure has a fantastic bakery. I did not get this cake but it sure looks drool-worthy to me! They have an amazing array of sweets and treats to satisfy your sweet tooth. The first fruit that we tried last night from Nino Salvaggio’s was the midnight rose apriums. These are a hybrid fruit that is a mix of plums and apricots. They had a nice firm texture and also a nice rosy hue for the flesh. As far as the taste goes, they were quite sweet but not overly sweet. They had the perfect amount of sweetness to them. I purchased four of these fruits and I do really wish I had more. After we came home and unloaded the groceries it was time to pick up more food. We had a ClickList order waiting for us at Kroger. Ahhhhhh I sure do love grocery pick up day. At the end of the week the fridge and pantry starts getting bare. I love bringing home my groceries and seeing a fridge and freezer packed to the gills with stuff! I put a fancy little dessert on our grocery list. I have had my eye on these for quite some time now. I got the TickleBelly Carnival Cotton Candy bars. They are cake pops dipped in a cotton candy shell. Oh, sweet heavens were these delish! Our Kroger has a cute display inside of mermaid-ish items and these were part of the display. My whole family loved these. There are 4 in a pack and we each had one. We will all have to fight over who gets the last one! I am definitely going to hunt down more flavors of these bars and give them a whirl ASAP! Today is now Saturday and I am unsure of what the day has in store for us. Maybe the beach with my rescue dog, Stormy? I am also not sure of what we will be feasting upon for dinner tonight. It will likely be steak or another from-scratch pizza. Whatever I do end up making tonight will be fun. I am sure of that! Do you have any fun plans this weekend? Have you recently tried a new food and fell in love. Let me know in the comments. I sure would love to hear from you. Comments always brighten my day over here! 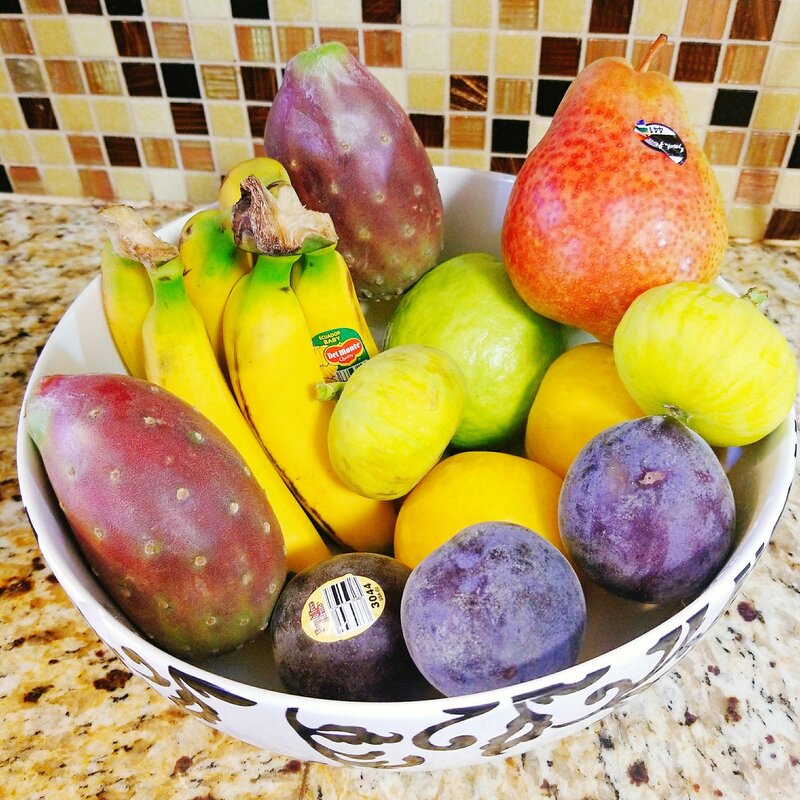 This entry was posted in Local Spots I Visited and tagged baby bananas, cactus pear, candy sprinkles, Chloe, figs, forelle pear, fruit, grocery haul, grocery shopping, guava, kiwano horned melon, midnight rose aprium, ninos, popsicle, produce, protein, svelte, sy thai, Zoku. Bookmark the permalink. I plan on tasting many Michigan made wines as we will be attending Tawas Uncork’d. It is a wine, craft beer and food festival, all Michigan made. Love this festival!! I wish I could hang out with you. I miss you! Good read, my son loves getting exotic fruits try too. The melon wasnt a favorite of ours.